The Latin Prince is an accomplished DJ with an exceptional gift to sense and respond rapidly to the crowds ear at a deeper level with his thrilling and surprising sound blends to drive the dance floor wild. Be it Hip Hop, Latin, EDM and spanning to any genre or decade. With an ‘open format’ approach and versatility to meet all music tastes. The Latin Prince keeps those feet moving and energy on a high and in his own words ‘puts himself in the middle of the dance floor’ and ‘reaches out to capture the soul of everyone’ and give them the best experience. ing promotional campaigns at TVT Records (Pitbull’s early career) National Director of Mix Show West Coast for Universal Records/Motown Records in Los Angeles. The Latin Prince has also launched his own marketing and promotions company called Urban Jungle Music. Still room for fingers in different pies, fast forward to today The Latin Prince takes the crowning title as Regional Director ‘East’ at DJ City, Yet The Latin Prince still finds time to cut and scratch put together remixes for Pitbull’s Globalization radio on SiriusXM on Channel 13 every week and DJ at various spots around the world. 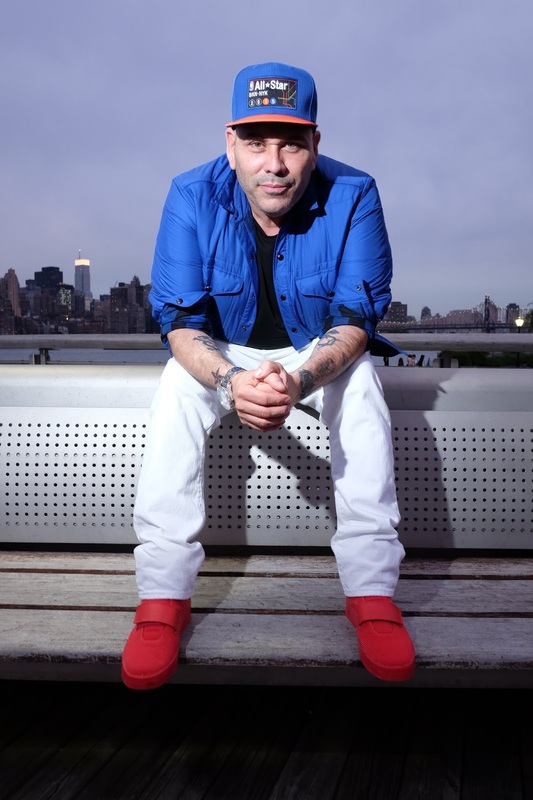 Known also as simply ‘LP’, with his outside the DJ booth thinking the Latin Prince is also a Brand Ambassador to the Official Belaire and has his own clothing line Official Sucia. Humble and approachable, The Latin Prince always gets the crowd going not only through the airwaves of Globalization Radio but also on the dance floor where he mingles with the crowd in between to take snaps with party goers and makes time to stop for a friendly chat. 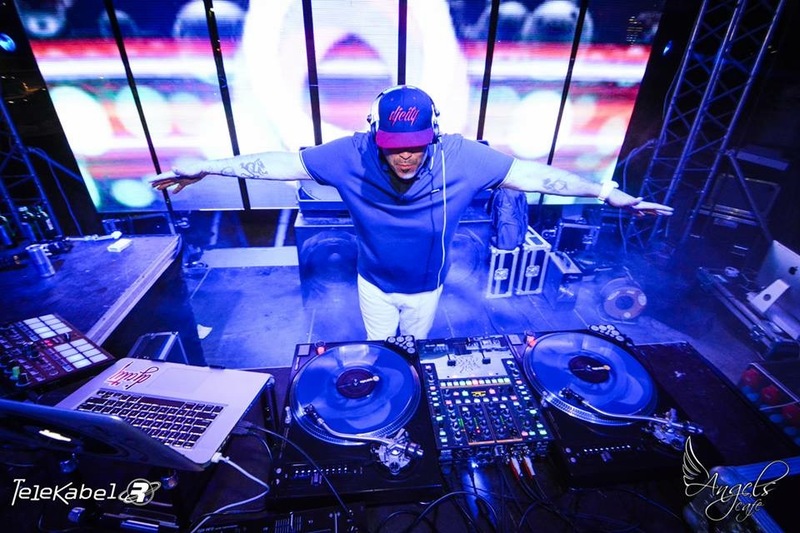 After what felt like many nights of dancing away to his energetic and spellbinding mixes, I was lucky enough to catch the talented DJ and entrepreneur on the Pitbull Cruise who has a warm, fun and magnetic personality to match. 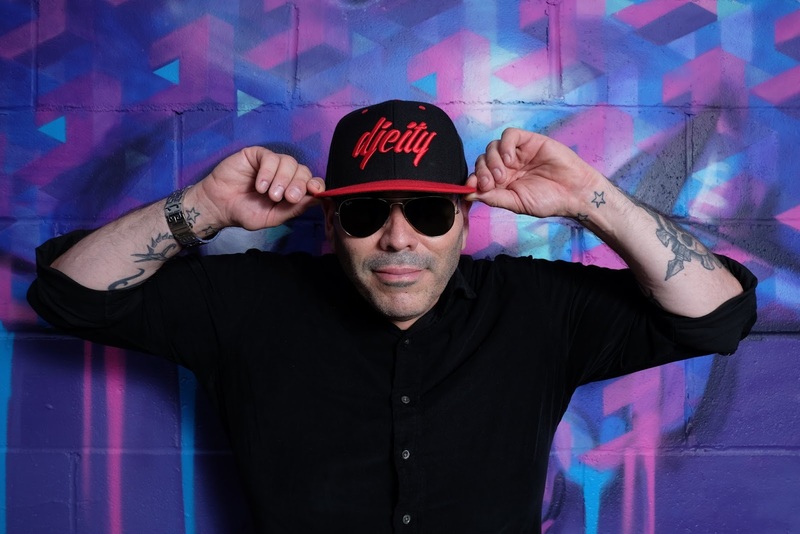 The Latin Prince talks to us about his career, DJ City, Globalization, Pitbull, influences and favourite artists to a DJ’s super powers of controlling emotions and sparking memories, his new upcoming album and much more. Hi Latin Prince! Thanks for taking the time to talk to me…So tell me, how did the name Latin Prince come about? It’s very simple, especially because I’m Latino - there’s the ‘Latin’ part of it but I’m also a huge fanatic of the artist Prince. So that’s how the ‘Prince’ part came about. Latin Prince! I’m Latino then the Prince part of it. Kind of like a homage to the King. I’m a fanatic! I got to meet Prince before and the story goes on ..but that’s the origin of where the name came from. Simple. But to the point. For anyone who hasn’t yet heard one of your sets, how would you describe your style? I would say I’m an open format DJ. I don’t like to ‘pigeon hole’ myself to a particular genre and be thought of as “We want to hire him because all he plays is Hip Hop or we just want him to do an EDM set because that’s all he does” For me it’s like being an open format DJ and being able to play everything. I consider my set a journey. I take you into a journey where you’re going to listen to your favourite R&B, you’re going to listen to some up tempo dance stuff and be “Oh I haven’t heard that“ for a minute and be like yesterday (on the Pitbull Cruise set) you heard some journey. We played Sweet Caroline (Neil Diamond) and music like that. Just some feel good music that motivates the heart and gets you going. I want people to be in that atmosphere where they feel like “Oh My God this is just amazing, I’m listening to some of my favourite jams that I haven’t heard in a while” or just the way it’s put together and the execution of how I do my mixes - so definitely open format is the journey I like to take people on. What music did you grow up listening to. Prince being one of them, as you have talked about and who are your favourite artists today? Growing up I would go through my mum’s collection of music – she has Spanish music but also Funk. Commodores, Tower of Power when I was growing up and those kind of genres of music. Very, very Funk influenced life so I love it. In the 80’s listening to Cameo. You know what I’m saying! Exactly, like Word Up. That kind of vibe. Even when I started first DJ-ing I just loved playing that kind of funky stuff like Midnight Starr and those kind of vibes. It’s so funny because I was playing some of that stuff last night and I was looking up and there was this guy like ”Right…you’re playing that stuff” but they really don’t know what you’re playing because it’s a younger generation. Even when playing freestyle like Expose, Debbie Deb. Some people and demographics know their music. But that’s what I grew up on for the most part growing up in San Fransisco. One of the greatest cities where I feel there’s a music culture where you listen to everything (laughs). So I would say those were my influences at the very beginning and of course some Spanish. Today? Who are my favourite artist besides from Pitbull? I love The Weeknd – he’s amazing. A very talented artist. That’s a hard question. I cannot forget about Bruno Mars. Bruno Mars is, how can I say this, he’s like the new James Brown. He’s such a good performer he just gives you that energy, he goes in all 100%. JLO I love. When I’m looking at my computer I have my sets categorised. But for the most part I just go with the flow! Some DJ’s prepare their sets and go with “I’m going to play this” For me because I DJ so much I have an idea of what I want to play and I’m just watching the crowd. What I do is put myself in the middle of the dancefloor. LP is right in the middle of the dancefloor so If I’m a party goer what do I want to listen to? If I throw in this jam or play this other song. I’m going to lose it. That’s how I prepare myself. You definitely made people lose it on this ship! And that’s my high. Making people feel good! I told a friend a long time ago, you know how there’s a God and doctors might be God-like because they can help save lives or heal you? In a way as a DJ to be able to control people’s emotions is a very powerful thing. You can be in the middle of the dance floor and hear a song and feel a certain way. For example for me it’s like I would listen to a song and think what was I doing? What kind of great memories sparked when I heard that song? Maybe I had a break up or maybe I had the best time on this trip with my boys, or I would be just doing something fun and that song would be the most popular one at the time. It’s a journey where the music touches you. Like you reach out and capture the soul of everyone and you move them. And that’s very powerful to be able to control peoples emotions. Completely…Tell me, for those of us that aren’t familiar, what is DJ City? DJ City is the No.1 record pool on the globe. If you’re a DJ and you need content where do you go? You go to DJ City. Record labels give DJ City promo music which they are pushing and give us the files. You pay for those files. Basically, we curate the music and give you the best. There’s a lot of music out there but we make sure that when you come to DJ City you pick the right music, the best quality and we have everything from Hip Hop, EDM to House, Spanish to Dancehall and Reggae. Like I say, everything. Whatever is popular, whatever is coming up and making waves. That’s where you go to DJ City. It’s $1 a day – as $30 a month subscription. You subscribe, we do a little background check and if all is ok you get in. Our offices are world headquarters. Culver City California. We have DJ City Japan, DJ City UK. It’s really huge for us in the UK. We have Germany and we have a lot of satellite offices like in Italy, France, Finland and much more so we are definitely a worldwide operation and we take pride in that too. To make sure everyone is getting the best service. I’m in charge of all East Coast operations and I look out for markets from Florida to all the way to the top, New England. You know how they say out sight out of mind? My job is to make sure that people and DJ’s understand and know that we are here. That DJ City is here to help you, here to serve you by any means necessary. My job is to create events. You’ve stepped out of the DJ arena expanding to, Producer, Remixer, Video DJ – You’ve worked with so many artists in so many different ways, are there any particular projects you are the most proud of? Every project I put myself into, my hands into, I endorse, or I am a part of in anyway promotion-wise or just in the making of. I think every person I work with is very special. Everyone definitely has a special touch and I think everything that I have worked with has been a dear project to myself. I’m scrolling through your Instagram and one minute you’re in this city, next minute you’re in that country! Looks like you’re giving Pitbull a run for the ‘Mr Worldwide’ title. What’s your favourite city? Wow! my favourite city? Hong Kong has been amazing. I say Hong Kong because it captured my eye. But you know I’ve been around the world and been to so many different places. I think every city I love because every city has its own touch, its own spark. So when I go to Croatia I love it because the food is amazing, the beaches, the islands and just the whole vibe is incredible. I love Berlin, I think there’s a certain swag about that city. When I go to the UK and go to London I’m just about the castles and the medieval things! When you’re in London, let’s go inside Buckingham Palace! Yes, let’s book that! I think every city that I go to has it’s own special moments. It’s tough. I think I love every city because it brings something to the eye and my heart and I really have fun. Thailand has his own thing, Australia has its own beauty. It’s been a pleasure to be able to experience and see all these amazing places and be able to talk about it. Get paid to do what I love. I LOVE EVERY CITY GODAMMIT! Speaking of Mr Worldwide, you both go back a long way - how did you first come to work together? When Pitbull got signed to TVT (Records), they said “Hey, we got this new kid named Pitbull. Just take him with you and do what you do” and we went on the road and my job was to introduce him to every DJ and every possible situation where it would benefit him. I said to Pitbull “Listen, you’re going to meet all these guys. I want you to take everybody’s information, I want you to give them information as well and if they need anything, if they need a drop? Do it. If they need a jingle or if they want you to do a mix tape with them? Do it. I want you to be accessible to the guys who are going to be helping you break your music. Because at the end of the day it all starts with the DJ and it all ends with the DJ. For you, what would you say is the best part about working with Pitbull? Learning from him. I continue to just learn. Pitbull’s vision, energy it motivates me. When I listen to the new music it just makes me push harder and now that we’re independent and we don't depend on a label, it’s our show, it’s even better and we’re playing by our own rules. Pitbull is just an incredible soul, he’s very driven and I appreciate that from him. I really enjoy your sets on Globalization - How did the station come about on SiriusXM? When Pitbull got the channel, Edwin (DJ Phenom. President of DJ City Worldwide and SiriusXM Radio Program Director of Pitbull's Globalization Radio) said we definitely want to get you a slot. I’ve been blessed to be able to entertain the masses and every week when I put my shows together I take a lot of pride and really take my time to mix. I want to make sure that everyone listens to some new stuff, stuff that’s about to become big and of course sprinkle some old stuff and again take them into that journey. I’m cooking, I’m cooking (laughs) That’s what I’m doing. That’s how the whole thing came about. It’s been amazing to be able to transfer that energy. Do you have a favourite Pitbull song or album? Calle Ocho has always been my favourite. I just love that sample! 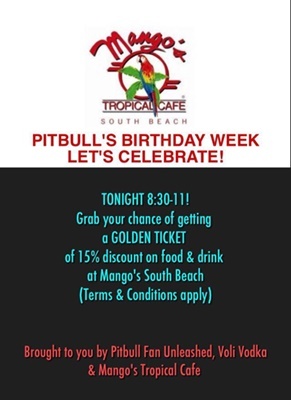 What’s your ‘banker’ Pitbull song guaranteed to get the crowd going on the dance floor? Timber – Always! Pitbull has a lot of bangers but the girls especially seem to love the combination of Pitbull and Kesha. We’re here on the Pitbull Cruise – What three things can’t you cruise without? Hmm…. (long pause and thinks hard) What are your three things? I would say my shoe collection, my camera and my equipment. Are there any crazy things that have happened on your journey so far? There’s been a crazy situation when I was DJ-ing and some drunk guy just came and poured their beer on my equipment and everything just stopped working. Wow, someone actually did that? Yes. When people request music and you don’t play their music sometimes they become obnoxious “When are you gonna play my song? When are you gonna play?” I’m like, I got you. Don’t forget I’m not going to just pass my journey so I could play your song. So I say I promise I will play it but you’ve got to give me some time to fit it into my set. For the most part I always like to play their requests and it’s lovely when they come back and say “Thank you so much that meant a lot for you to play the song” But there are times when you deal with unpleasant people. What’s the most valuable lesson you have learnt in the industry? I thank you Pitbull very much for letting me open up for you and Enrique Iglesias at Madison Square Gardens. That was amazing. That was the highlight - I mean that’s a legendary venue to be able to open up to a sell-out crowd. That was an amazing experience and Pitbull put me there. That’s something that was the moment for me as a DJ. You’ve been in the game for a long time, do you think technology has damaged the true authentic art of DJ-ing with vinyl or helped it along? Let me take it from there! For us ‘seasoned veterans’ the technology has helped us to not carry crates of records. I remember back in the day travelling and just carrying records, losing records on planes, or somebody left my crate behind. I think that technology is coming. You can’t stop it. In all fields from medical to music – it comes to where you are getting new tools for how to do your job and you have to embrace it. There’s been conversations in the past ‘anyone can be a DJ’ if you have a music library but it’s about how you present and execute it. That’s what separates you from everybody else. Your mixes make me want to get up, dance and escape! A complete energy shifter! Are there any DJ’s that do it for you? Jazzy Jeff - He is somebody who I really enjoy. DJ Craze. Some of these freestyle guys just really bring some fire to a set. Who would be your dream to DJ, produce or remix for? To DJ with? I’d say Jazzy Jeff. I would love to do some remix work with DJ Craze- he’s also from Nicaragua and definitely has a dope ear! So you’re going to teach me how to DJ right? When is that happening? We definitely have to prepare a class for you. The question is do we need to get you some gear? Like you’re going to go home and you won’t practice. So the first thing we need to get you is a controller. The first thing you are going to have to learn is your Beats Per Minute. BPM. Every song has a Beats Per Minute. One song might have 102 BPM’s another has 90 BPM’s. That’s the first thing as a DJ you have to learn, your Beats Per Minute because that’s how you blend. All the songs are blended by their beats per minute. For example, I have a song that’s 94 BPM’s and I have another one that’s 94 BPMS and it’s a smooth transition. And keys - Is it an A or B? And they blend smoother. Learn your history about music. Especially the young DJ’s. I ask who do you think is old school and they come up with an artist that really isn’t old school. Us DJ’s need to somehow find a way to educate the youth and bring them up to speed and have them learn. Music has been around so long. I mean even last night when I was playing Stand By Me (Ben E King) it’s that feel good journey. If you ask someone who did Stand By Me and they say is that Travis Scott? No. Actually, my next question was going to be if you had any advice to up and coming DJ’s? 3.Stay humble, don’t think that you’re better than anybody else. I really respect a humble DJ. For example when I speak to Jazzy Jeff he’s so humble and gives me the time and respect but yet he’s such a huge talent. When you have that mentality of humblness and level of respect, your peers will really respect you. I’m working on my album. What I’m planning on doing is put out a 2 cd and 2 vinyl where one side is going to be Hip Hop and R&B and the other side House and EDM. Some up tempo dance on one side and then some Hip Hop that you could groove to. It's going to be called Music Is My Weapon. Looking forward to that! Please Let us know when the album is coming out Latin Prince! And thank you sharing more with us and all the great memories and music on the Pitbull Cruise! An absolute honour and pleasure to have meet you.